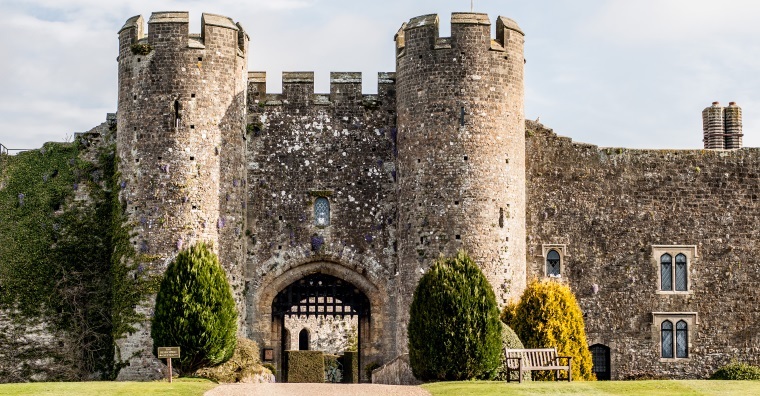 The southern county of West Sussex has a large number of stately homes and castles, so it is no real surprise that it also has its fair share of local ghost stories. 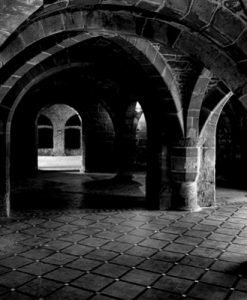 Let’s take a closer look at the West Sussex ghosts in some of the county’s most haunted locations. 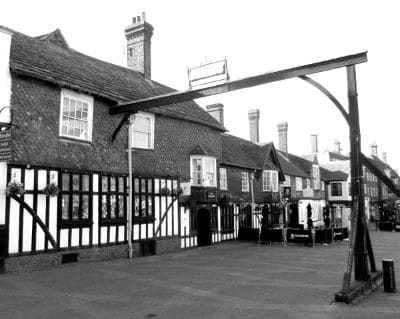 The Angel Inn can be found in the heart of the bustling market town of Petworth. It is a Grade II listed building parts of which actually date back to medieval times, although the majority of the building is actually from the 18th century. The hotel is reportedly haunted by the ghost of an old lady who died under some tragic, if unusual circumstances! The story goes that the lady saw her friend slip and fall down the stairs of the hotel, resulting in her death. The shock of seeing this tragic accident involving her friend apparently killed her – presumably from a heart attack – and her spirit now seems to be bound to the hotel. 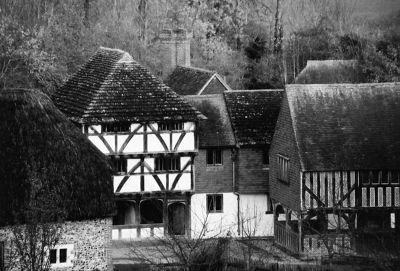 Don’t be put off by the fact that the name of Weald & Downland Open Air Museum of Historic Buildings is a bit of a mouthful, it is still one of the best places if you are off in search of West Sussex ghosts! It is also a pretty amazing place anyway! Imagine a rescue centre for old houses and you have some idea of what to expect. The museum sits in fifty acres of land and consists of fifty different buildings, some of which are up to 400 years old. These were building marked for demolition which were saved from all over the south of England. Each one was carefully dismantled and then rebuilt at the museum. As you might expect, many of these old buildings seem to have brought their ghosts with them to their new locations, because the site is said to be a veritable hotbed for paranormal activity! Just some of the eerie goings on reported includes dark shadowy figures hanging around a building that once housed a medieval shop. 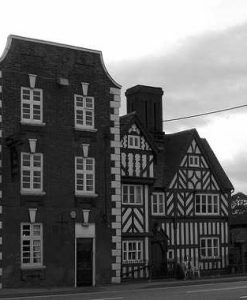 Another building is haunted by a very tall, and equally as scary ghost of a former male resident and another Tudor house originally from Walderton also has a former tenant still in residence! Staff have reported seeing a woman in a long dress walking from house to house on a number of occasions and one of the medieval thatched cottages has a dark figure standing in the doorway on a regular basis. However, all of this is nothing compared to the most haunted building out of all of the ones at the museum – the hall house from Midhurst. 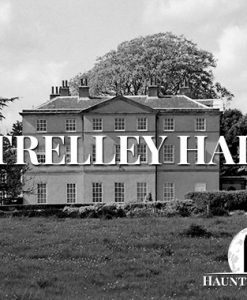 This building seems to be the focus of some poltergeist activity, plus people have reported phantom footsteps and shadowy figures within the house. The village of Bramber is home to a ruined castle – Bramber Castle, which was a Norman motte-and-bailey style castle dating back to 1070. The castle was buily by William De Braose on a natural mound overlooking the River Adur and it remain the de Barose family home until around 1326. From then on, the records are patchy, but there were definitely a few batlles around the castle in the English Civil War back in 1642. All that is left now is the remains of the Gatehouse tower, a section of the curtain wall and the small church that stands opposite it. As noted, historical records get a little sketchy, so it is unclear how the castle passed out of the hands of the de Braose family, but the popular belief is that William de Braose – 4th Lord of Bramber did something which upset King John I. This resulted in his children being imprisoned in Windsor Castle and starved to death. 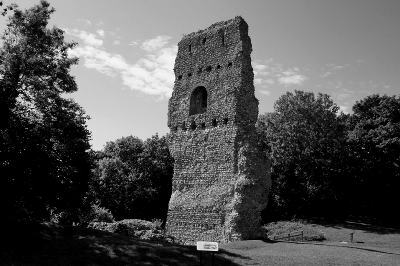 It is said that upon death, the children returned home to Bramber Castle where they are still seen frequently dressed in rags and begging for food in the grounds. The Ramada Crawley, was formerly a coaching inn and it is actually made up of various different sections from different time periods. A hotel has stood on this site in one form or another since at least 1579. None of the current exterior is original, although the core of the hotel could very well be 16th century. 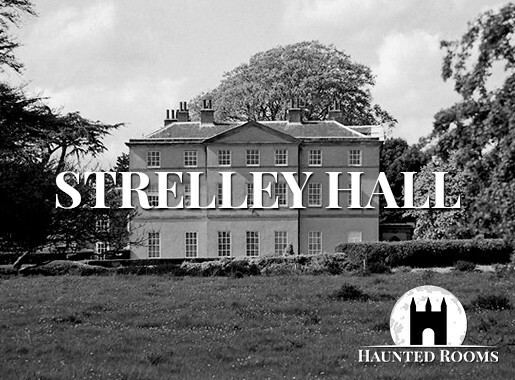 With that in mind, it is no wonder that this is one of the most haunted places in West Sussex. 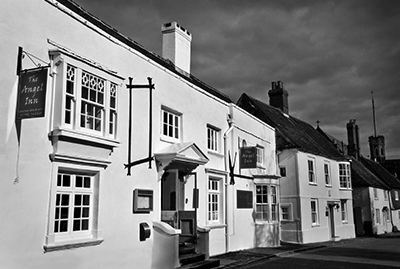 One of the spirits who are believed to haunt the hotel is the ghost of Mark Hurston, a former night watchman who died after drinking poisoned wine. It is thought that this was planted for him to consume either by someone planning on breaking into the hotel, or perhaps by a disgruntled guest that he had woken up! Ever since his death staff and guests alike have been reporting strange occurrences including a broom cupboard door that keeps being left open despite being locked each night, lights turning on and off and strange figures appearing and disappearing. Is Mark still patrolling the property even in death? When looking at haunted West Sussex, one of the strangest areas would have to be Chanctonbury Rings. This ancient hill fort dominates a hilltop above the village of Washington inside of South Downs National Park. Chanctonbury Rings has an excellent position both from a military and a historical point of view and over the years it has been the site of a number of paranormal encounters and other mysteries including UFOs! 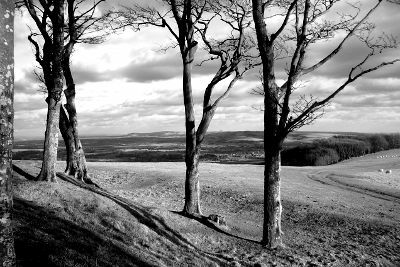 In 1764, a young Charles Goring decided to plant Beech trees on top of the Chanctonbury hill-fort and his plans were met with public outcry from those who said that it would spoil the view of the South Downs. Charles went ahead despite this and by the time he dies in 1829 his trees had reached maturity. However, as the trees grew, the roots disturbed some previously undiscovered ruins of a Romano-British temple that was buried on the site! A complete excavation took place in the 1900s revealing a temple with a court which had sunk into the soil. There were also several other significant finds including coins and other objects dating back to Nero (54AD) and Gratian (375AD). All of this is interesting, but not exactly paranormal although it is this unique history that has contributed to the activity at the site. Chanctonbury Rings has long been associated not just with paranormal activity, but also with witchcraft and UFOS. One of the most compelling reports comes from a paranormal research group who camped at the location in 1974. One of them walked through the centre of the ring only to be lifted a few feet off the ground by an unseen force. He was in some pain and was heard to beg ‘no more’ over and over again until he was suddenly dropped to the ground. There have also been many UFO sightings over the last 50 or so years with many reports only involving strange unidentified lights in the sky. However, in October 1972, one man was walking in Chanctonbury Rings with friends when they saw what they thought was a bonfire. However, on approaching they realised that the dull red flickering light came from an object that hung above them in the sky! The Amberley Castle Hotel is a Grade I listed 12 century building which started out as a timber framed hunting lodge in 1103. It was upgraded over the years and became a fortified manor house in 1377 when it was owned by the bishop of Chichester. Even after the Reformation, the church was still owned the building, but it was least out to the crown. The castle fell into disrepair after it was partially destroyed during the English civil war, but in 1893 the Duke of Norfolk leased the property and began the renovation work. These days, the castle has been transformed into a luxury hotel. 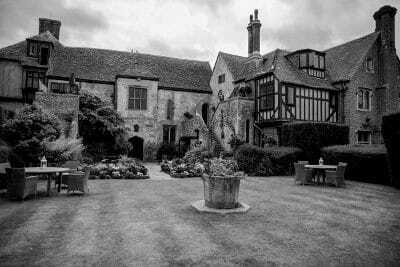 Amberley Castle Hotel is reputed to be haunted by the ghost of a young girl named Emily. 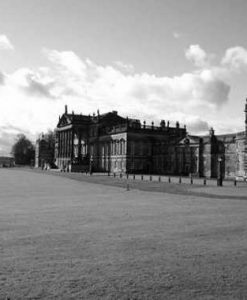 The story goes that Emily was working at the castle and fell hopelessly in love with a Bishop who was living there. Emily ended up becoming pregnant in the very early stages of their relationship and the Bishop immediately rejected her. The girl was heartbroken and climbed the spiral staircases to the uppermost part of the battlements where she jumped to her death. Her ghostly presence is now felt around the battlements, particularly in the ‘Hertsmonceux Room’.